A series of anti-war protests rolled through the US on Saturday, condemning Washington’s involvement in past and ongoing conflicts in the wider Middle East. Organized by the Answer Coalition and supported by other anti-war activist groups including CodePink and Popular Resistance, the activists marched from outside the CNN headquarters on Sunset Boulevard to the TCL Chinese Theatre in the heart of Hollywood. “All the weapons that the United States have sent are in the arms of ISIS. Look at the photos. Look at the videos. All ISIS has is US made weapons. The communication equipment is all US made,” actor Johnny Achi told the crowd. 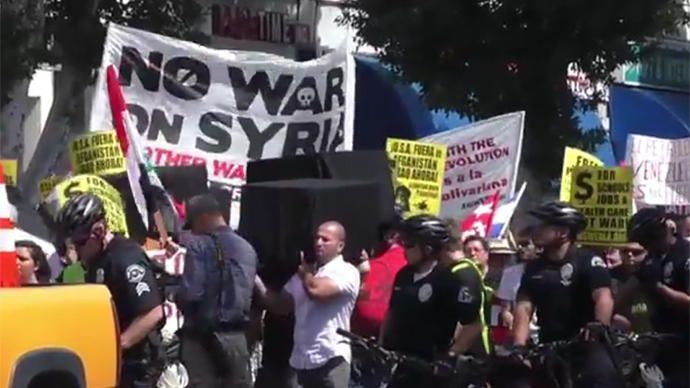 Earlier in the day a 200-strong crowd of anti-war activists took to the streets of Washington DC, as part of a three day 'Spring Rising' campaign, that stands in opposition to US military interventions across the globe – especially its drone campaigns. A drone sculpture, with “killer” written on it, awaited the crowd as it gathered in front of the White House. Marching from the White House to Capitol Hill some wore orange jumpsuits and black hoods like Guantanamo Bay prisoners. Some others carried coffins with Iraqi and Libyan flags draped over them. On the way to Capitol Hill, protesters made stops at offices of organizations and defense contractors accused of providing assistance to the government’s military campaigns. They took their time laying symbolic flag-draped coffins at their doorsteps.